Xi'an Cuisine is my favorite addition to Chinatown in years, much needed with the decline of the Hu Dynasty. The idiom here is simplicity - basic dishes with few ingredients, not heavily seasoned, harmonizing elementally. There are plenty of places for salt and umami and ma la punches up and down Cermak and Archer. Here, you get a splash of vinegar on some raw vegetables and tofu skin, a knot of chili paste on cold or hot hand-pulled noodles, and some griddled meats with fresh peppers and herbs stuffed between a simple flatbread. These bing are best of breed not only in Chicago, but against my East Cost forays to Gene's Flatbread Cafe in Boston and Xi'an Famous Foods in NY, both prized (as we do GNRs) in their respective cities. The meats have the perfect unctuous fat and seared vegetable ratios, and the breads are greaseless with a hard crackle on the outside and soft interior that soaks in juices and table vinegar. (They could honestly teach the local arepas attempts something about texture and balance). This is also a place that has improved markedly since opening, with an expanded menu and better service. I almost had a heart-e-tack when they closed for remodeling, but they opened brighter and more confident, and while they did away (at least temporarily) with my favorite lacy beef-and-noodle dumplings, the house homestyle pork-and-veg potstickers and hot and sour hand-pulled noodles (which might edge Northern Style and Homestyle Taste favorites) have filled and overflowed that gap. Others in main thread have either been initially impressed or won over by revisits. This is also a really significant favorite of respected Mssrs. Pang and Dolinsky; they are among the folks who have praised the awesome owners, who incidentally also set the best complimentary Lunar New Year dessert spread I've ever seen last week. I would be thrilled to see a new GNR in Chinatown to help tell the story there to visitors. turkob wrote: The tofu skin with celery is marinated in a white vinegar sauce. I'm a big fan of the simple dishes you see in a lot of Chinese cuisines that marry two or three basic flavors and textures together in perfect harmony...This sour, crunchy dish is a terrific balancing force next to the rich and complex noodle dishes. turkob wrote: Liangpi cold noodles are perhaps the most famous dish from Xi'an. The noodles are meant to be thick and springy and this rendition was exactly that. ...This is as satisfying as a plate of cold noodles can get. laikom wrote: I thought the hand sandwiches were excellent, the lamb was tender, and the pork was like a funky pulled pork, with lots of sticky skin and fat mixed in. Jefe wrote: Loved the textural interplay of the celery dish, a dance of crunch and chew, seasoned aggressively with vinegar. Unlike turkob's photo upthread, ours had wood ear mushrooms in the mix for more chewy fun. Loved the juicy, well seasoned lamb in the crunchy griddled bread as well. botd wrote: For the price, that pork bing is the best sandwich in Chicago. I also enjoyed the heck out of the vermicelli and spinach in Zhenjiang vinegar but then spinach+black vinegar is one of my favorite combinations. A beverage colophon: their hot tea in the tall glasses is simple and perfect, and their smoothie game is quite strong. On warmer days I really like a fruit tea and a few skewers there, something I see many tables of locals enjoying. Nice, beat me to it! Not only my favorite cheap lunch in China town (celery & tofu skin + lamb flat bread= still only $6.50), but one of the Chinese meals that I crave most frequently. Its low impact, I really appreciate how easy it is to dine solo (an underrated quality around these parts). You can order the perfect amount of food for one, no pesky take out containers and you can get out of there with a little spring left in your step. Food that is simple, satisfying, and soulful. An unassuming spot that has become an indispensable pin on my food map. This, to me, is the most interesting Chinese restaurant in the city right now. A far cry from the ever-popular pep of Sichuan food, Xi'an Cuisine appears somewhat understated, even pedestrian, but it is by far the closest I've come to homemade Chinese food in restaurant form in Chicago. The boiled peanuts, the tofu and celery, the tofu "noodles" in chili sauce, and even the simple but solid cucumbers with sesame sauce satisfy immensely. The noodles have that distinctive hand-made character that supports whatever medium they are delivered in. And the jia bing? Absolutely as good as the ones I ate in China during my college days. Nothing is heavy or oily; just fresh and simply prepared and perfect (and cheap!). Definite GNR material. It's hard to stand out in a neighborhood like Chinatown with so many unique and wonderful options, but Xi'an definitely pulls it off. They're doing something no one else in town is doing and they're doing it extremely well. 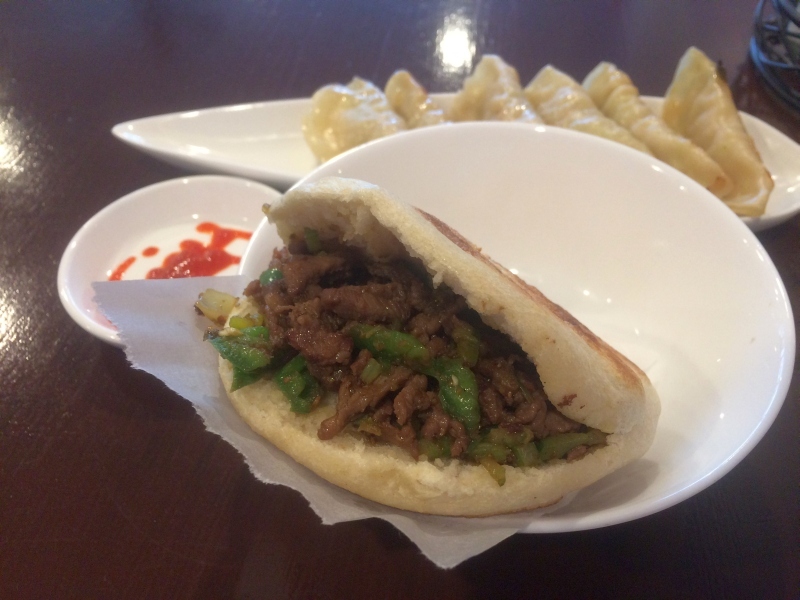 Xi'an is destination dining for anyone who loves lamb. Thumbs up for GNR! Jefe wrote: Food that is simple, satisfying, and soulful. An unassuming spot that has become an indispensable pin on my food map. Well said, GNR, yes please!